I wandered into Laser Video at the weekend, determined to have an evening alone with a DVD, decent takeaway and roaring fire. After 20 minutes of looking around i spotted the cover for Four Eyed Monsters; and after a quick scan of the blurb on the back decided that it deserved a watch. I didn't anticipate just how much it would affect me. Arin Crumley and Susan Buice have created an amazing piece of work that i urge you to seek out. It quite literally is a labour of love. Four Eyed Monsters documents Buice and Crumley's real life relationship which grew from meeting on Myspace. Before meeting for the first time they decided to do things a little differently. For the first 3 or 4 months they didn't speak a word to each other and communicated solely through writing, art or video. 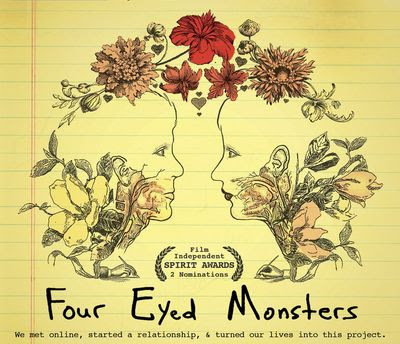 Four Eyed Monsters follows the birth and growth of their relationship. To really see the full picture you need to watch the episodes and the film itself. I admire their bravery for putting themselves and their relationship out there, for believing in their art and for taking an independent stance. F.E.M became the first ever film uploaded in it's entirety to YouTube in 2007. They have used their website, YouTube and Myspace to promote the film. Many people have been affected by it in the same way i have been and as a result a type of grassroots movement has sprung up around it. I don't want to give anymore away but I've featured the 1st episode below for you to get a taste of it.